In the iconic film “Forrest Gump,” the grizzled Lieutenant Dan told his troops that in order to survive the jungles of Vietnam’s Mekong Delta, they would have to take care of the their feet. While the turkey woods can in no way compare to the horrors of the Vietnam War, the mantra holds true-you will be able to comfortably cover more ground, and thus be more successful, if you take care of your feet. Spring turkey hunting is a sport where your feet can make the difference. Persistence is undoubtedly a trait that separates the killers from the amateurs, and not having sore feet or blisters can allow you to climb the next ridge or walk the extra mile in search of a gobbling turkey. Even though many hunters now use UTVs or their trucks to cover ground, at some point all turkey hunters will be forced to trek the woods on their feet. Fortunately, there are more than a few footwear options to keep you in the woods when the game is on the line, and not soaking your feet back at the camp. Lacrosse revolutionized the rubber boot market in the early 2000’s when they introduced their popular Alpha Burly series, blending a traditional rubber knee boot with a neoprene interior. Since introducing the Alpha series, Lacrosse has improved upon their initial design, most recently rolling out the AeroHead. The AeroHead features new liquid polyurethane over neoprene construction that gives you a comfortable feel while trekking through the turkey woods, while still being tough enough to cut through the briars and brambles. With additional heel support from its Ankle-Fit design, it gives you the comfort necessary to climb that next ridge. If you are looking for a comfortable and versatile boot that can keep you in the field throughout the course of the season and through a variety of situations, then the Lacrosse AeroHead is your boot. If you have ever worn a pair of Danner boots, then you know that comfort is not one area that their boots lack in. Danner builds comfort into every boot, and the Pathfinder GTX is no different. The lace-up style boots are 100% waterproof, feature 1000 grams of Thinsulate, and the pair weighs only 62 ounces. Their TERRA FORCE X sole gives the boot the highest level of traction, while not compromising comfort. Give the Danner Pathfinder GTX a try if you are a hunter that wants to cover as much ground as it takes to bring that big gobbler home. There may be no creature that can dampen our enthusiasm for chasing after a vocal gobbler than a venomous snake. Snakes are simply an obstacle we must navigate in the woods, and Rocky’s Lynx snake boots can give you the confidence needed to put the serpents in the back of your head when you are on the move. With fifteen inches of protection, waterproof construction, and a comfortable sole, the Lynx is perfect for hunters who spend time in “at risk areas.” The Lynx is covered in Mossy Oak Break-Up, keeping your boots from being the thing that tips off an approaching gobbler. While the crew at Drake Waterfowl may be known for their brilliant waterfowl hunting gear, they have stumbled upon the crème de la crème of turkey hunting boots with their EST Knee High Mudder boots. Built in a similar mold to other lightweight rubber boots on the market, what separates the EST is that the calf and shin portion of the boot is more lightweight than other options, making it money on hot late season days. Additionally, Drake’s patented D2D Comfortrac System™ and “athletic traction sole” provide a snug fit and less slipping and sliding in muddy conditions. To boot (pun intended), the EST Knee High Mudder is available in Mossy Oak Bottomland, a pattern that just oozes turkey hunting tradition. 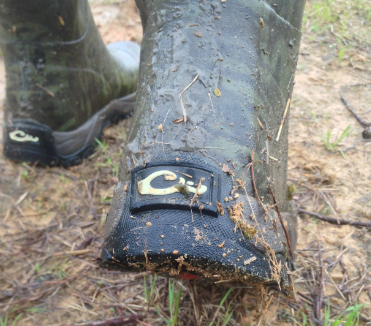 My personal boot of choice when I am hunting in “no shoulder country,” the Woody Sport Armor Cool boot is a true water-and snake-proof option for turkey hunters who hunt anywhere that snakes are an issue. While the Kevlar coating does make them a tad bit stiffer than other rubber boot offerings, they are more than comfortable enough to make long prospecting runs for lonely gobblers, thanks in part to their trademarked Xpress Cool lining system. The traction system, dubbed the Speed Track, gives you the grip needed to climb muddy ridges in the heat of the hunt. Complete with Mossy Oak’s Obsession pattern, this is an all-around great boot if you hunt where serpents are an issue.